Welcome to the restoration blog of my 1973 Citroën DS23 Pallas. Manufactured at the Quai de Javel factory in Paris, this is a 5 speed manual transmission carburettor model finished in Beige Tholonet and Caramel Jersey Velours rayé interior. Post 1974 Model Year DS' were fitted with hazard lights as standard, as this was shortly before the end of production there was no updated wiring or layout diagrams available (unless you know otherwise?) I have produced my own wiring diagrams which are loosely based on the original but simplified for ease of use. 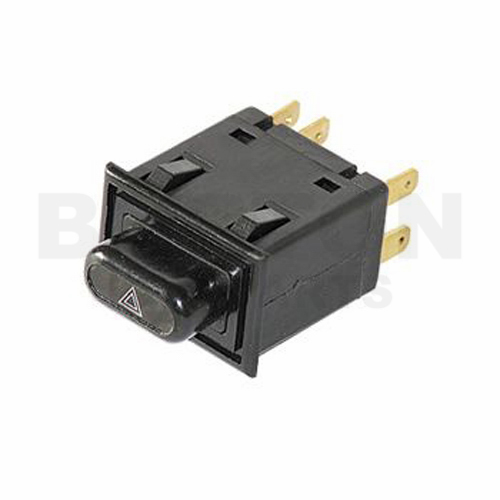 There are various ways of making the existing flasher unit operate all four indicators with the use of a relay(s) but with the use of a correct switch there is no need for additional relays. The original flasher unit operation relied on a bi-metal strip heating up and breaking/making a connection, the speed of this depended on the battery state, wiring connections, good earths, bulb condition, etc. Adding an additional two indicators and a warning lamp will change the speed again. 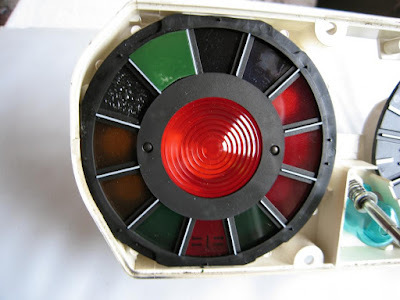 The solution is to replace the old flasher unit with an electronic three pin flasher unit which will flash at a constant speed in all conditions. First and foremost DISCONECT THE BATTERY you don’t want any sparks, burnt fingers or melted wiring. Don’t say I didn’t warn you. 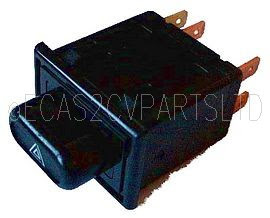 You will need access to the flasher unit and indicator switch by removing the dash binnacle. Replace the flasher unit as per wiring diagram and using a black wire add an additional earth to pin 31. Next you will need to fit your hazard switch, where you fit this is up to you. The original one fitted in the metal part of the dash next to the choke cable (carb.model), if you don’t fancy cutting the metal part of the dash use the plastic facia panel that houses the other switches; I think that’s close enough. The aperture required is 30mm. x 20mm. How the switch works. (DS option) This has one feed in from the flasher unit and three feeds out to LH indicator, RH indicator and warning lamp. Told you it was simple. (2CV option) The switch is basically two sets of contacts joined by the action of the push button. Set 1, this redirects the ignition live to a permanent live so you can use the hazards without the ignition being switched on. Set 2, this has one feed in from the flasher unit and three feeds out to LH indicator, RH indicator and warning lamp as per the DS option. The good thing about this layout is (a) your hazard lights will operate with the ignition off and (b) you won’t leave your indicators flashing all night by mistake. 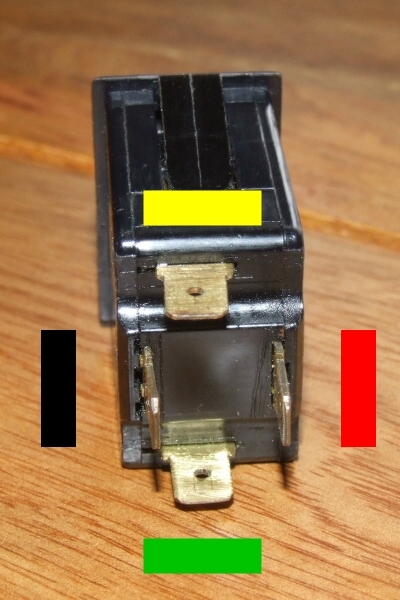 2CV option; (Set 1) the original yellow wire from F3 goes to the normally closed (NC) contact and the common contact now goes to pin 49 of the new flasher unit. This will allow normal operation of the direction indicators with the ignition on and a new permanent feed from F5 which supplies the normally open (NO) feed for the hazard lights, you can alternatively us a feed from the +ve accessory post. Next (Set 2) supply the common (NO) contacts with a red wire which connects to either the red wire on the indicator switch or pin 49a on the new flasher unit whichever is the easiest, this will feed all four indicators and the dash warning lamp when activated. The (NO) contacts feed the indicators via a new green and yellow wire which are spliced into the existing wiring from the indicator switch. Finally the last feed is for the dash warning lamp. DS option; as per Set2 on the 2CV option. On the white plug that connects onto the dash binnacle there is a spare connection in the middle row this supplies the feed to the hazard warning lamp, connect a black wire to this from the switch and fit a new lamp holder at the very lower blank space in the binnacle (Hold it up to the light and you will see a red lens with the four arrows on it) The earth for the warning lamp is already in place. Reconnect the battery, rebuild your dash binnacle and test your new hazard lights. Last thing, you will be drawing extra load on the indicator circuit with the hazards lights switched on, so if you find yourself blowing a fuse just up the rating by 4 Amps for the additional 2x21W and 4W bulbs. Wiring diagrams can be found here, feel free to download. Good work, a few observations. . .
That page also shows the original position of the switch as sitting between the clock and choke knob (carby cars). There is a picture of my own 1974 Australian delivered DSpecial using the triangle motif on the switch. I would advise that as the hazard switch is quite large/cumbersome that swapping the interior light switch into the plastic switch panel (you may still need to cut an additional hole) and then utilising it's space on the metal dash for the hazard switch would be a better option. Darrin at Citroen Classics also provides a afermarket diagram, should be a link to his PDF on that same aussiefrogs link. Thanks for your input, It's great news to here that there was a service bulletin about the hazzards, I had a feeling there must have been something out there. The aussiefrogs thread is a great read thank you. If you have a .pdf file for the diagrams and bulletin could you mail them to me, Thanks in advance. websitereaction@gmail.com and I will put some updated info on this blog. Factory trained with Citroen Cars at Egham, Walkden and Slough, alround DS nut, LHM in my veins... and red wine!